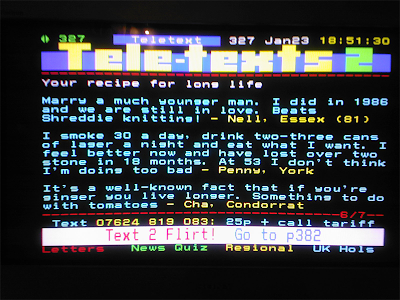 A reader of Gingerism.com spotted this comment on ITV's teletext and emailed it in to us. (Click on the image to enlarge it). The text reads: "It's a well-known fact that if you're ginger you live longer. Something to do with tomatoes - Cha, Condorrat". Thanks to Gingerism reader Andy Old for emailing in this photo.